We were very lucky to be invited to visit Rainforestation, near Kuranda Village. Our day started early, to make sure we didn’t miss anything. 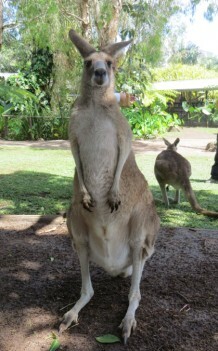 Upon getting there, there was a lovely lady waiting for us (and other guests) to guide us through the most typical animals of Australia. 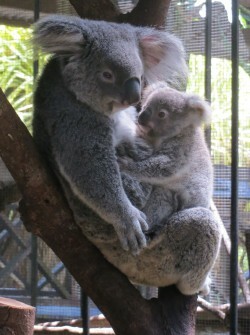 Our first stop was a visit to the koalas, probably the cutest animal on the planet. Normally these animals basically just eat and sleep and most people will just see them resting on a Eucalytus branch, not moving at all. However, we were delighted with the show they put on for us. There was a female koala holding a baby and they didn’t stop moving. We promise that we were there for more than 15 minutes and have dozens of photos of them. When the guide could finally take us away from the koalas, we went on to see the crocodiles. We didn’t think that it was too big until we saw it outside the water. Its name is ‘Jack the Ripper’ and its fate is to spend the rest of its life alone. You may think that it is unfair unfair for the little creature, but if you were a female crocodile and knew that he had killed 12 of its girlfriends, you would probably think differently. I’m fascinated by crocodiles as well, for different reasons, and it took a while to drag me away. 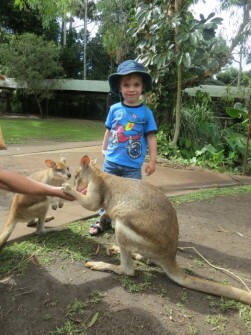 And then onto the kangaroos, Nicholas’ favourite animals. He was very eager to hand feed them but then was a little bit nervous about getting too close. 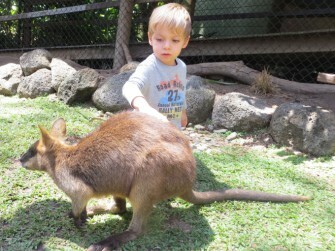 He still had a good time touching the little wallabies and giggled every single time one of them took food off his hand and licked him. Another attraction inside Rainforestation is the Pamagirri Aboriginal Experience, where an Aboriginal dance group showed us some of their traditional dances as well as how to play the didgeridoo and how to throw a boomerang. The absolute highlight of my day was when Nicholas put his hand up first to play the didgeridoo but then to go on stage and dance with them. What a gorgeous little boy we have had. And, before lunch, we went on an Army Duck, an amphibious vehicle used during the Second World War. For those of you who don’t know what an amphibious vehicle is, I can only ask you to imagine a mix between a 4WD and a boat. It can ride on the road using its wheels, but when it comes across water, it slides easily and, without any noise, sails away. Very useful on those times. And to top a fantastic day off, we had lunch there as well. It was a delicious buffet, with lots of different dishes, many of them with a strong Asian influence. What surprised me most was the cheese platter with dried figs and grapes that we had for dessert. 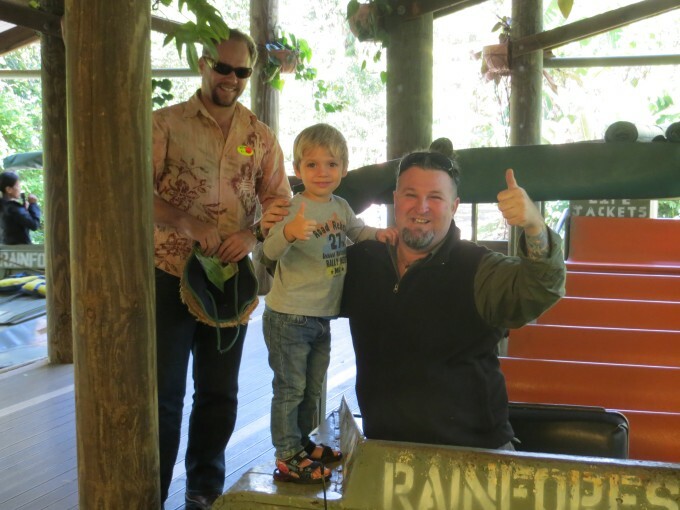 This entry was posted on Friday, October 4th, 2013 at 9:24 am	and is filed under Family friendly activities, Tourist attractions. You can follow any responses to this entry through the RSS 2.0 feed. You can leave a response, or trackback from your own site.